This fish is very intolerant to species of their own kind, do you should keep him solitaire. When you keep them together with Discus or Angelfish they make a lot of problems. You should plant the aquarium very densely because they need hiding places. Although it has been bred in the aquarium, spawnings are rare because of its aggressive nature toward its own kind. 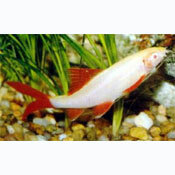 Its aggressiveness seems to increase with age, and may be minimized with a larger aquarium and plenty of hiding places.